When Mike McCarthy founded Capital Office Interiors in 1974, his objective was to capitalize on Ottawa’s stable, government-based economy to sell office furniture. Over the last 45 years they have morphed into a company that helps clients leverage their workplaces to enhance their businesses. Capital Office Interiors shows organizations how their space can affect their success using integrated architecture, furniture and technology to create best in class customer experiences. Capital Office Interiors continues to learn from, and adapt to, our constantly changing world. Join us in celebrating 45 amazing years! Keep the day's momentum going with an after business hours networking experience in a casual setting that's sure to engage. 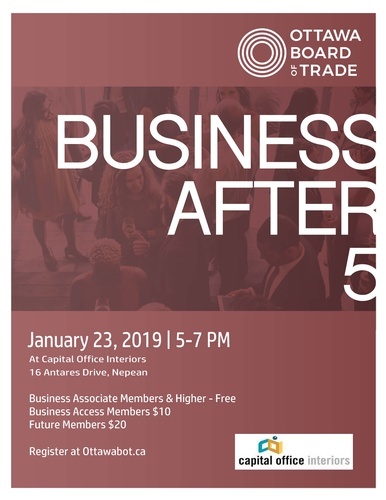 Enjoy complimentary hors-d'oeuvres and drinks as you network with your peers, establish new working relationships and get a better understanding of the challenges facing businesses in Ottawa.